Don’t Worry ‘Bout Me is a beautiful song about the loss of love. 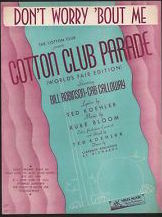 The song was introduced in the Cotton Club Parade – World’s Fair Edition. “Don’t Worry ‘Bout Me” was recorded on April 4, 1961 and released in 1961 on the album My Heart Sings. It was arranged by Ralph Burns. “Don’t Worry ‘Bout Me” was recorded in June 1992 and was released that year on Perfectly Frank. It was arranged by Ralph Sharon.